As with modern architecture, one of the most common things for home improvements is light when extending your home, however often this also brings a few unwanted issues. 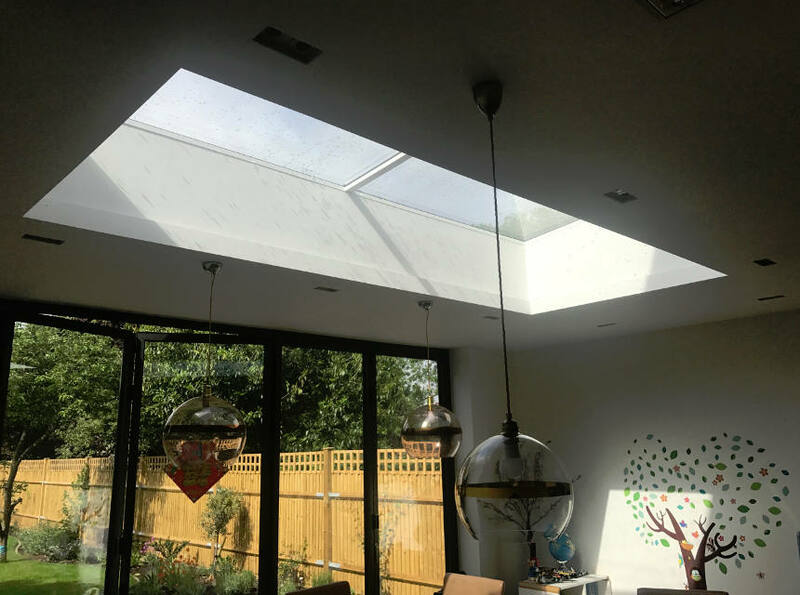 Roof-lights and skylights bring a flood of light into our kitchens and living areas creating a bright ambiance but also require a level of control. As with many home improvement situations we come across, creating a suitable balance between light, shade and heat is a common conundrum and there are arguments for both internal and external solutions, and therefore the right decisions need to be addressed. On this occasion we elected for an external system with our Markilux 770 and Vuscreen ALU fabric due to the client brief. This system provides answers in many forms, externally fitted and Combined with Vuscreen ALU fabric with aluminum pigmenting woven into the yarn, this provides superior reduction of heat gain and solar glare, plus the special weaving technique provides see-through transparency thus providing the reduction in heat but allowing light and providing a perfect balance. The system is only visible when required, leaving the beauty of the skylight and the minimalistic style of the room untouched. Overall we were delighted to find the perfect solution for a cool happy customer with control at the touch of a button.